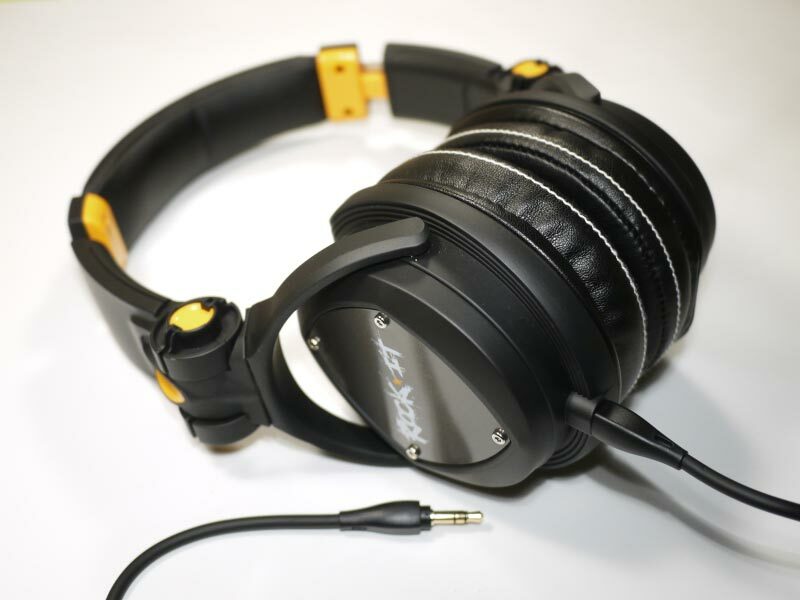 Build Quality (8/10): No complaints here – the R-DJ is plasticky on the outside but its construction is no worse than those of many higher-end DJ headphones. The plastics are rubberized and pleasant to the touch. The headband has a wide metal band running through it and metal plates decorate the earcups. The construction is a little tough to fold up but in terms of durability should last the course. The coiled cable is detachable, terminated with an locking connector at the headphone end and an I-plug on the other side. It’s a bit heavy but still very much usable both at home and while on the move. Comfort (8.5/10): The R-DJ clamps pretty tightly but has thick pads and spacious cups to it’s comfortable to wear for long periods of time. The pleather pads feature handsome white stitching (a-la Skullcandy Mix Master) and the headband pad is amply soft. Those who are sensitive to clamping pressure might be better off with Rock-It Sounds’ similarly-priced R-Studio model but on the whole the R-DJ is very comfortable. Isolation (8/10): The well-sealing pads and good clamping force put the R-DJ on par with other DJ headphones, such as the Ultrasone PRO450 and Numark PHX, in this regard. 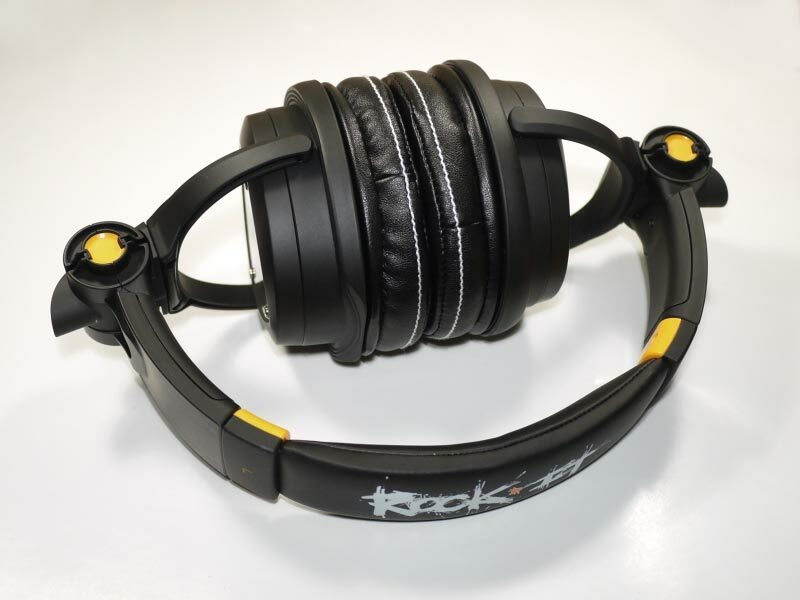 Sound (7.25/10): The sound of the Rock-It Sounds R-DJ is not atypical of a DJ headphone – the headphone has strong bass, slightly less prominent mids, and good treble energy. It’s a slightly v-shaped signature, but an enjoyable one for sure. I preferred the R-DJ to Rock-It Sounds’ similarly-priced R-Studio model for its tighter bass – the R-Studio may be a little less v-shaped in signature but its bass is boomier compared to the R-DJ. The midrange of the R-DJ is slightly laid back but not overly recessed. The bass is tight enough that bleed is not an issue and while it wasn’t as clear as the rather more thin-sounding Sennheiser HD428, on the whole I did not find the R-DJ to be lacking in clarity for the price. The treble of the R-DJ has good energy. It’s a little prone to sibilance, but only when sibilance is present on the track. The pricier Creative Aurvana Live! 2 is admittedly a little smoother and more refined, especially at high volumes, but it’s not hugely better than the R-DJ. The Monoprice 8323, on the other hand, is a little too dark in comparison to the Rock-It Sounds set. The presentation of the R-DJ is pretty wide – almost on par with the HD428 but with better depth, making the Sennheiser unit sound overly distant in comparison. It makes the Monoprice 8323 sound overly closed-in and congested. The R-DJ is not the most precise headphone, but for a sub-$100 enhanced-bass DJ set its imaging is not bad at all. Value (8.5/10): The Rock-It Sounds R-DJ is my favorite out of the company’s latest releases, offering up a slightly v-shaped sound signature with ample bass. The sound is a little rough around the edges, but it has no major flaws and is easy to enjoy. The design, likewise, uses a lot of plastic but the R-DJ easily competes with pricier DJ cans in comfort, durability, and isolation. I even like the compact, easy-to-recycle packaging. Overall, an easy recommendation for a versatile DJ-style headphone.